The main difference between hemoglobin and hematocrit is that hemoglobin is the iron-containing protein responsible for carrying oxygen in red blood cells whereas hematocrit is the volume of red blood cells compared to the total blood volume. Furthermore, hemoglobin level for males is 14 to 18 g/dl; that for females is 12 to 16 g/dl while the normal hematocrit for men should be 40 to 54%; for women it should be 36 to 48%. Hemoglobin and hematocrit are two important measurements of the oxygen-carrying capacity of the blood. Hematocrit (%) is equal to three times value of hemoglobin (g/dl). 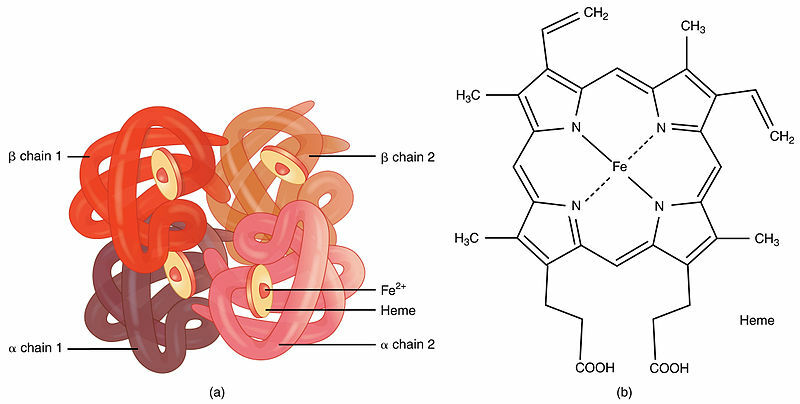 Hemoglobin (Hb) is the iron-containing protein that occurs in red blood cells. Therefore, the main function of hemoglobin is to carry oxygen throughout the body, supplying it to the metabolizing tissues. Thus, sufficient hemoglobin levels should be in the blood for adequate tissue oxygenation. The reference value of hemoglobin is 14 to 18 g/dl in males while 12 to 16 g/dl in females. However, low hemoglobin levels in the blood indicate anemic conditions. On the contrary, high hemoglobin levels can be identified with erythrocytosis, which is a consequence of excessive amounts of red blood cells in the blood. Well-mixed EDTA-anticoagulated whole blood is the specimen for measuring the hemoglobin levels in the blood. First, all the hemoglobin in the blood is converted into cyanomethemoglobin, which is then measured by a colorimeter. Also, hemoglobin electrophoresis is another method which measures the mobility of hemoglobin in an electric field. Hematocrit (Hct) (Ht) is the measurement of the volume of red blood cells with respect to the total volume of blood. Several methods are responsible for measuring hematocrit. The two main methods are the direct measurement of the hematocrit by microhematocrit centrifugation and the calculation of the hematocrit indirectly. Also, automated cell counters can calculate it by multiplying the red cell count (millions/mm3) by the mean corpuscular volume (MCV). Here, MCV is the average volume of a red blood cell. However, the measurement of hematocrit, as well as the hemoglobin levels, depends on the plasma volume. Both values appear high in severely dehydrated individuals while they become low in individuals overloaded with fluids. In both conditions, in order to assume the normal values, independent radionuclide evaluation of the red cells and plasma has to be performed. Hemoglobin and hematocrit are two measurements of the oxygen-carrying capacity of red blood cells. Whole blood is taken for measuring both hemoglobin levels and the hematocrit. Therefore, both measurements depend on the plasma volume. Furthermore, hematocrit (%) is equal to the three times value of hemoglobin (g/dl). Besides, abnormally low measurements of hemoglobin and hematocrit indicate anemic conditions. Hemoglobin refers to a red protein responsible for transporting oxygen in the blood of vertebrates while hematocrit refers to the ratio of the volume of red blood cells to the total volume of blood. This is the main difference between hemoglobin and hematocrit. Moreover, hemoglobin tests measure the amount of hemoglobin per unit volume of blood while hematocrit measures the volume of red blood cells with respect to the total blood volume. 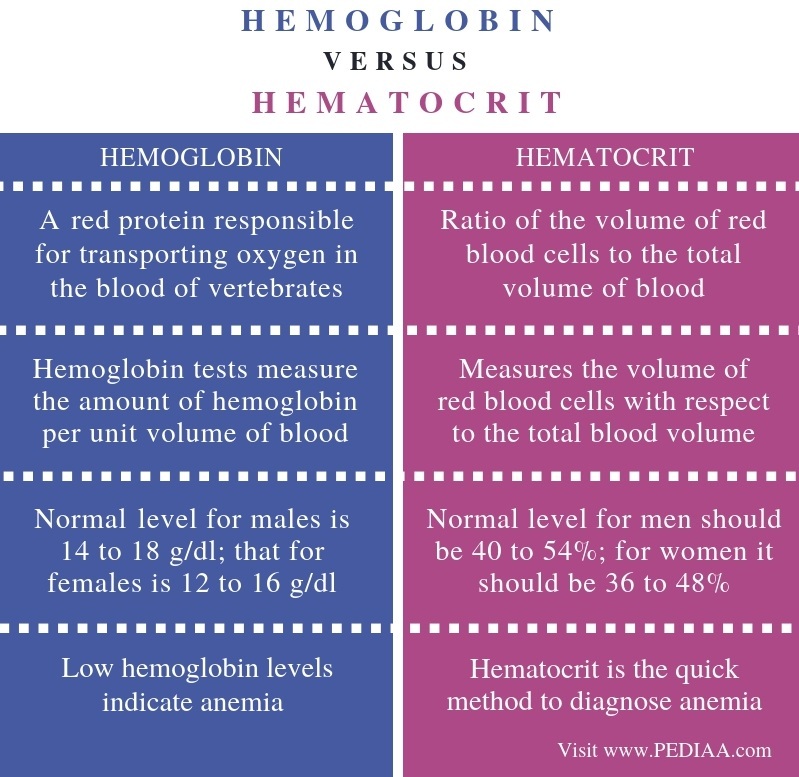 Hemoglobin level for males is 14 to 18 g/dl; that for females is 12 to 16 g/dl while the normal hematocrit for men should be 40 to 54%; for women it should be 36 to 48%. This is another difference between hemoglobin and hematocrit. 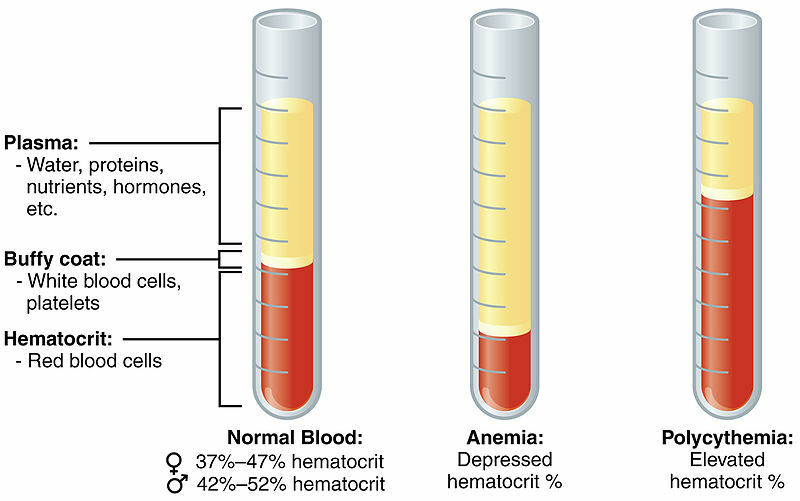 Furthermore, low hemoglobin levels indicate anemia while hematocrit is the quick method to diagnose anemia. Hemoglobin is the iron-containing protein found in red blood cells. Hemoglobin levels indicate the amount of hemoglobin present per unit volume of blood of a particular individual. In comparison, hematocrit is the volume of red blood cells with respect to the volume of the blood. Therefore, both hemoglobin levels and hematocrit measure the capacity of blood to carry oxygen. However, the main difference between hemoglobin and hematocrit is the type of parameters measured.